Over 2,000 children stole the hearts of about 60,000 spectators at the Jawaharlal Nehru Stadium as they performed to the tunes of 'Vande Matram' and created a rangoli pattern on the field as part of the Closing Ceremony of the XIX Commonwealth Games 2010 Delhi. 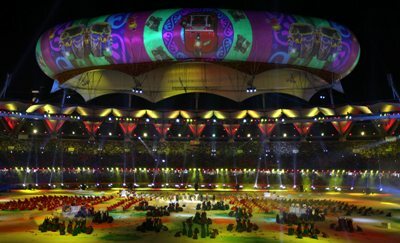 It began with 2010 school children from the national capital, dressed in white costumes, taking over the centre of the stadium to form a rangoli pattern. As a group of children moved in to form the Ashoka Chakra in the centre of the rangoli, others holding coloured powder dispensers sprinkled colours of the Indian flag creating an eye catching moment of patriotism. As the colours settled, what one got to see was the children covered in various shades of the Indian flag creating a tri-coloured rangoli. With the laser lights cutting across, the scene was indeed spectacular. They also flipped their costumes and the rangoli patterns transformed to reveal beautiful combinations. As the 'Vande Matram' tunes come to an end, tri-coloured pyros took off from the roof of the stadium, signalling the end of about a 15-minute segment. They were followed by the athletes of the Games who entered the field together as one big contingent. Together with the marshals, who also came in, the athletes placed themselves in such a manner that they depict the Wheel of Life, an intrinsic part of the Games 2010 logo. Over 2,700 shots of fireworks, 25 stacks of speakers producing 500,000 watts of sound and 1,200 moving lights combined with the majestic aerostat came together to create a spectacular Closing Ceremony of the Games. Leaving the about 60,000 spectators spellbound were the lighting arrangements that took people through various moods, from that of national pride when the national anthem was being played to that of pure ecstasy as laser beams cut through the grand stadium. Technological combination of 1,200 moving lights, 120 space cannons and 16 follow spots weighing left the spectators is sheer awe. Another attraction was the Aerostat, suspended 25 metres above the ground. With a size of 40m X 80m X 12m and a 360 degree projection surface, the aerostat was really a showstopper.